Greens, SNP and rebel Labour MSPs back Lib Dem motion in the face of Tory opposition. 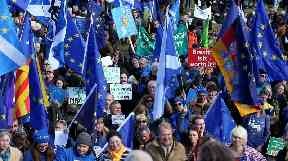 Holyrood voted 66 to 28 in favour of a People's Vote after it was put forward in a Liberal Democrat amendment to a government motion during a chamber debate on the Brexit threat to international scientific research in Scotland. Two rebel Labour MSPs also gave their support, including the Scottish party's former leader Kezia Dugdale. She said it was the first time in her seven years as an MSP that she defied the Labour whip, adding: "I have been a longstanding supporter of a People's Vote and I believe it would be a democratic outrage if the people of the UK are not given the chance to stop Brexit. "The Scottish Parliament has sent out a strong message and I urge the UK Government to listen." Party colleague Daniel Johnson joined her to back a People's Vote while all remaining Labour MSPs abstained, as did SNP MSP Kenneth Gibson. Liberal Democrat MSP Tavish Scott, who tabled the motion, said: "This is a momentous vote. The Scottish Parliament is the first in the UK to back a People's Vote. It won't be the last. This will only get bigger. "MSPs and MPs who back the People's Vote are fast forming the biggest and most cohesive bloc in British politics. Every day, more and more people are coming to the conclusion that the public should have their say on the final Brexit deal." He called on Labour leader Jeremy Corbyn and the party's Scottish leader to "change their strategy and build a majority vote in every part of the UK". Scottish Green Party co-convener Patrick Harvie MSP said: "Tonight's vote was very clear, with an outright majority of MSPs voting in favour of a People's Vote, and renewing the strong message that Scotland should not be dragged out of Europe against the clear public will." A Scotland for a People's Vote campaign spokesman said: "This is a hugely significant and welcome decision of the Scottish Parliament - the first legislature in the UK to back a People's Vote." He added: "Democracy demands a People's Vote - where Holyrood has led, Westminster should follow."